Hereke Silk Rugs: Fine Art. Leer en nuestro sitio web comentarios cialis: tadalafil. es una medicina muy efectiva. Turkish Kilim rug, which are more like tapestries – soft and thin and used as sofa covers or wall hangings – are also increasingly in demand.Kilim is a flat-woven rug (though because of the artful nature of the kilim, many are hung on the wall as show-pieces instead of being used as a floor-covering) made in several regions of the world, including Turkey, Persia, and the Caucasus. Making a kilim is a highly regarded folk art; kilims that are handmade with natural dye and wool are the cultural norm. There is also a great deal of symbolism in the patterns used in each design. Some kilims are even used as Muslim prayer rugs. Because of the cultural aspects of these rugs, each region has its own traditions revolving around colors, styles, and patterns. Because of the regional nature of the differences in style, it is easy to identify the type of kilim by aesthetics. This has led to a particular region in Turkey choosing to patent their own brand of kilim.Here are Turkish Kilim Rug by region.Colors and designs are different according to the region they come from. 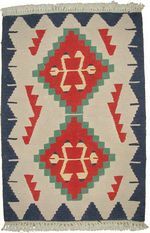 For great kilim kinds and pictures you must see Kilim.com is a comprehensive resource and store dedicated to traditional and contemporary kilims. 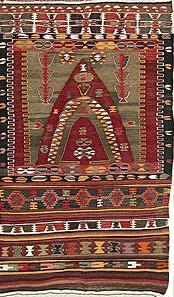 Located in the north west part of Turkey, Keles produces fairly coarse slit woven kilims having tribal features. 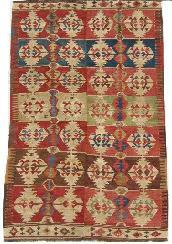 Keles kilims have subdued shades of reds, browns, blues and yellow. There are a broad range of prayer rug designs. Sarkoy kilims, decorated with tree of life and stylized birds, are woven in Bulgaria, Greece and the areas close to the Turkish Border. Birds and tree of life are the most prominent feature of these e kilims. Besides these motifs, human figures, stylized grape leaves, small praying niches and diamond designs are often encountered. Hooked diamond shaped medallions are also one of the major patters of Sarkoy kilims. Located in the north west part of Turkey, Bergama (ancient Pergamon) has been a great center for historical rugs and kilims. Bergama kilims always stayed very faithful to the traditional Seljuk designs and patters and contained geometrical paterns. 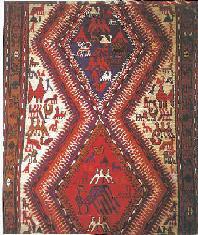 Stylized tree of life, rams horn are often used on these kilims. 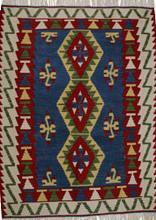 Although blue and red are the dominant colors, we have also multi colored kilims woven in the area. Pair of hand pattern or comb design which appear in the center of the kilim are typical for Bergama kilims. Zili and Cicims, woven in Bergama region, have traditional crosses, surrounded by squares which symbolize a chest, signifying the weaver desire to get married. Located in Balıkesir region, Yuncu has been home of reputed kilims, woven with large and powerful ornaments since the 16th century. Most prominent feature of these kilims are the tree of life or a pole with ram horns emerging from it. Red, blue, dark green are dominant colors for Yuncu kilims which are woven mostly in square form and made smaller than Anatolian kilims. 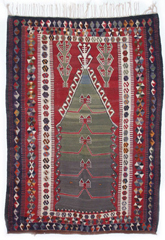 Yuncu kilims are dyed with madder roots (red color) and blue (indigo). 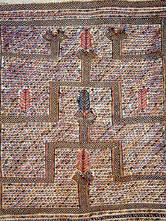 Ram horn is the main pattern on the well-demanded kilims. Kilims woven in Gordes, Kula, Usak, Izmir, Akhisan were known as Manastır Kilims. These kilims with simple patterns draw our attention with very vivid colors such as red, yellow and blue colors. Geometric medallions, running dog patters and narrow bands with tiny crosses are typical patterns of these kilims. Aydın, located in the western Anatolia, is noted for prayer arch kilims and large kilims with two halves. Although Aydın kilims have some similarities with Konya Kilims, they have more infill motifs and they look busier then than Konya Kilims. 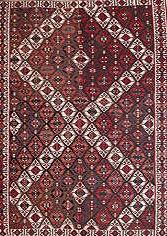 Small squarish amblems repeated vertically , hooked motifs, large central medallions are typical for AYDIN Kilims. Some Aydın Kilims are distinctive with long narrow central mihrap surrounded by the series of strip like borders. Located in the western Anatolia, the town of Esme produces both contemporary workshop kilim for export and some authentic regional kilims Esme Kilims, which have large medallions and amulet form, are decorated with small geometric and symbolic patterns all over them. most of the kilims, woven in Esme, have the slit weave technique and usually soft color such as pinks and grays. Because of their color combinations and fine weaving Esme kilims are much favored by the westerner. They often produce single or multiple hexagonal medallions. Whole ground of these kilims is filled with small and geometrical motifs. Most popular colors that Esme weavers use are pink, blue, yellow and orange. Small mihraps also appear on the Esme Kilims. Fethiye, located in the south west corner of Turkey, produces kilims with two major compositions. First category of these kilims has empty monochrome central medallion flanked by two heavily decorated end containing diamond designs. Second compositions offer a similar lay out. This time central field is filled various patters. Sivrihisar, which is located in the west of Ankara, is noted for the kilims which use series of vertically stacked prayer arches( known as bacalı or chimney patter). Eli belinde patterns is also quite common design on these kilims. Karapinar, located in Central Anatolia, is noted for the production of good quality regional kilims featuring praying niche patters. 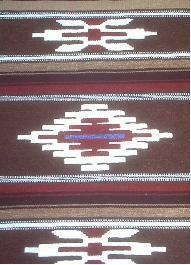 Karapinar kilims, woven in the slit weave technique, feature primitive tribal character and appearance. They have pale ground color and darker colors for the patters. Regional kilims, which are woven in the slitweave technique and plainweave use a wide range designs and motifs. Central medallions, repeating geometric patters and all-over designs are most common. Located in Central Anatolia near Konya, Kecimuhsine produces cicims in a unique patter based on cypress tree intersecting prayer arches. Kecimuhsine weavers use pale colors on the white or cream field. Having small size, Kecimushine cicims are highly collectable and fall into medium price range. Kayseri, once the capital of Cappadocia region, is an important kilim weaving center for regional and workshop kilims. 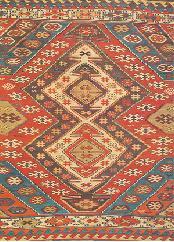 It is noted for silk kilims which are made only in this region. Kayseri workshop kilims may range in price and quality from medium to high bracket. Besides the loosely woven kilims some much finer kilims are woven in the area. 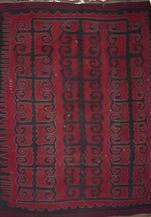 Colours used for the Kayseri kilims are often red, black, pink, gray. 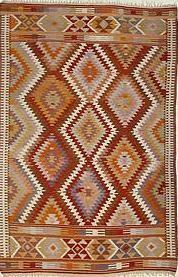 Regional Turkish kilim rug tends towards a more subdued Palette colors such as orange, yellow, brown and white. Paneled or banded compositions or very intricate designs all over patterns are used. Since the quality of the material and weaving varies considerably, it is important to judge all kilims from Kayseri region on their individual merits. Located in the eastern part of Turkey, Malatya is noted for workshop kilims and regional kilims of fine quality. Malatya Kilims have limited number of designs, especially for the big size of Kurdish Kilims. As to small size prayer kilims, there is more variety of designs are motifs. Mut village, located on the Taurus mountains of southern Turkey, is a center for nomadic and semi nomadic tribesmen. 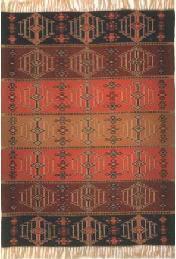 Mut weavers made kilims with tribal appearance and significant amount of wool, goat and horse hair. Designs are mainly bold and based on serrated and hexagonal medallions in a variety of repeated and interconnected designs. Located on the major trade roads, Nigde is noted for the fine quality of Turkish kilim rug which often feature serrated hexagonal motifs in complex. Renowned for its finely woven prayer kilims rugs( often decorated with tree of life), Obruk also produces cicims with the geometric forms ( medallions banded designs and interconnecting diamonds)of Turkish kilim rug. Obruk color palette varies from the bright to dark with the dominance of reds, blues, yellows, orange and white. 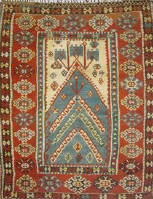 Situated in the south eastern part of Turkey, near the Syrian Border, Gaziantep was once the home of very fine kilims. Although Gaziantep doesn’t produce a great number of Turkish kilim rug today, old Anteps still appear on the market. Woven in the slit weave technique, Gaziantep kilims feature diamond designs (central diamond flanked by two smaller ones). and six pointed stars. 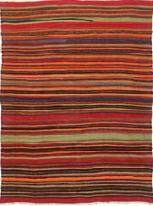 Gaziantep kilims have horizontal bands with various colors. The ying yang design (symbolizing the harmony), scorpion and eli belinde designs appear on the Gaziantep kilims. These very elaborate patterns are often highlighted with a white cotton for special effect. The kilims, which have dark backgrounds in black or deep brown and big floral patterns in reds, pinks and orange, are made in the Erzurum Region in the last forty years known as Turkish Karabags. 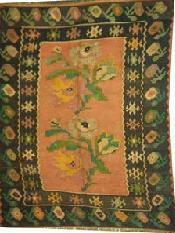 These kilims with big flowers are influenced by Karabag Kilims of Caucasus. These Turkish kilim rug with white and beige colored borders have long and narrow sizes. Kars, which is a major town on the Turkish Armenian border, produce kilims with Kurdish and Caucasian influence. Turkish Kilim Rug, made in the Kars region, feature a great variety of praying arches, repeating medallions and geometric compositions. The quality of these kilims and their patters change from very simple tribal designs to sophisticated and complex patters. Kars kilims having dark colors don’t suit to western furnishing demands. 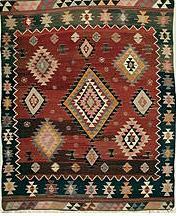 Kars Kilim, produced in the recent times tend to use softer palette of colors such as browns, pinks. orange and white. 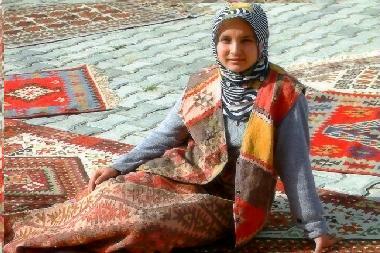 Van, major town in the eastern part of Turkey, is noted for its high quality kilims. It also acts an important marketing center for the Kurdish tribes. Main composition of Van Kilims based on large Hooked or crenellated diamond designs or on traditional banded patters using great deal of geometric infill motifs. Van kilims have pallette of dark colors with the predominance of red, blue, brown, green, yellow and white. The products of two largest Kurdish tribes Herki and Hartushi are sold in Van region. The weavers of Van use metallic thread a lot.